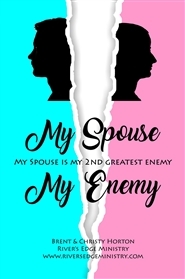 “My Spouse My Enemy” openly explores the Truth of God’s Word. Finding the treasures (Proverbs 2) for marriages to be rich. How to overcome problems arising from conflicts with our spouse, even if it is to the point that our spouse looks like our enemy. “Don't let TRUTH become Clichés in your Marriage!” Find the steps to let God’s Power change lives. We hope this book blesses you and your spouse, creating a deeper bond of love and intimacy within your marriage. We also hope and pray that it creates a new desire in you to have a closer relationship with God, seeing that His loving kindness has saturated all the pages of scripture for your good, your spouse’s good, and for His glory.